The sun is in Aquarius from January 19 to February 18. If your sun sign is not Aquarius, these stones are still useful. The zodiac energy of each sign surrounds all of us based on the time of the year. The energies of Scorpio are at work now. Aquarius falls between Capricorn and Pisces and embodies both of these signs. Capricorn is strict, hard-working and earth-bound while Pisces is a little woo-woo, out there. Aquarius is an interesting sign because it is unpredictable and rebellious. The symbol of the Water Bearer represents the use of water to wash away the past and give life to future. Think of this energy in revolutionary aspect: the Age of the Aquarius is named for this sign. It is a time to wipe away your past and move onto a better future. This energy comes to us at the beginning of the year: perfect timing for making changes. Amber is great to use when cleansing. As you prepare to make changes use it to heal your past and protect your future. A wonderful stone to receive spiritual guidance, Amethyst can help you determine what changes to make as you move into a new phase of the year. It is also great for grounding the air and water energy of this time of year, especially when used with Apatite. This is another stone that offers aid in communicating with your higher self and developing your own intuition. Use Angelite for guidance. Apatite reminds you to serve the greater good: for yourself, for others, for the world. As you are thinking about making changes, you’ll look at things in a different way when the sun is in Aquarius. Apatite helps you focus on big picture and keep a positive attitude about making changes that will make thing better for you and for others. Aquamarine is an intuitive crystal and arguably the best stone to use with Aquarian energy. Aquarius energy is in the mind and this is where change starts. Aquamarine takes in mental energy (air) and it’s able to communicate it into words. In other words it helps you turn your thoughts into reality. As you begin to make changes and cleanse yourself of your past, Garnet, the stone of commitment, helps you recognize those people and activities that you love and want to stay loyal to. Hematite is a wonderful stone for grounding all the air and water energy that Aquarius surrounds you with. It is also a detoxifying stone, which helps you wash away your past as you move into the future. Moonstone channels the goddess energy particularly energy from the Moon. The moon is strongly associated with water as is Aquarius. Moonstone is useful for enhancing all the wonderful Aquarius energy. Rainforest Jasper enhances creativity. The changes that are bound to begin with Aquarius energy can benefit from some creativity. Jasper also offers protection and balance for your future. Aquarius is an emotional sign. Larimar brings intuitive and celestial energies together in divine guidance just as the deeper ocean blue and lighter color blend. Larimar helps the thoughts in your mind about what you want your reality to look develop so that your emotions can work out how to make it personal. That’s how you can effect great change: thoughts to reality. 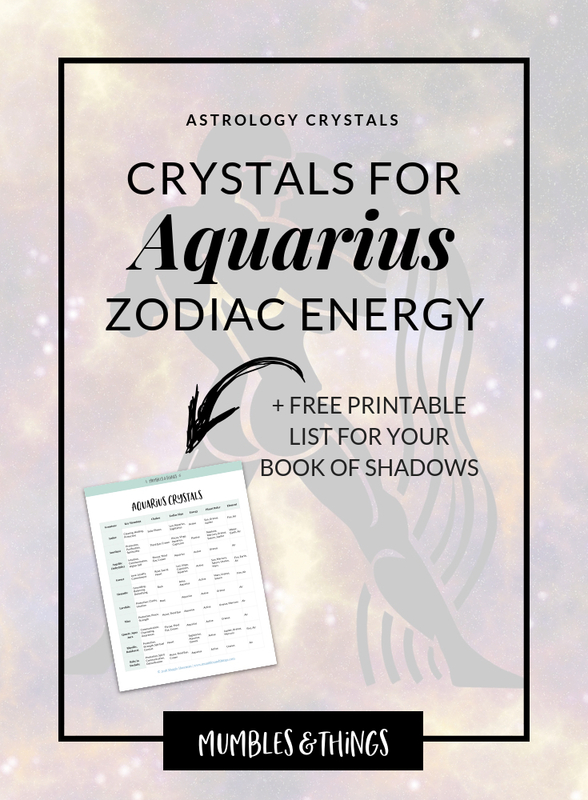 Want my list of Aquarius crystals? Click the button below to request your list to be sent to your inbox. This list includes the top 10 crystals associated with the zodiac sign Aquarius, plus, the three key uses, primary chakras, polar energy, planetary ruler and element correspondence.